Solatube is a company that specializes in daylighting and LEED lighting systems. They do both commercial and residential products. 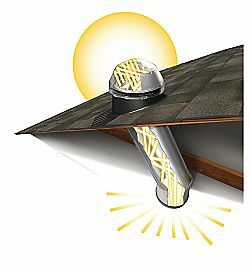 The dome is installed on the roof and collects sun into itself and the interior tube is aligned with mirrors that direct the light into the space below. The manufacturing of the tube is simple but the interior mirrors are highly complicated. There are various lenses that go on the tube to create a different ambiance within the spaces. It is very similar to electrical powered lights that are more common in homes.